In 12-inch skillet, cook bacon over medium-high heat, turning occasionally, until crisp; drain on paper towels. Crumble bacon; reserve 2 tablespoons bacon for garnish. In same skillet, cook beef over medium-high heat 5 to 7 minutes, stirring occasionally, until thoroughly cooked; drain. Reduce heat to low. 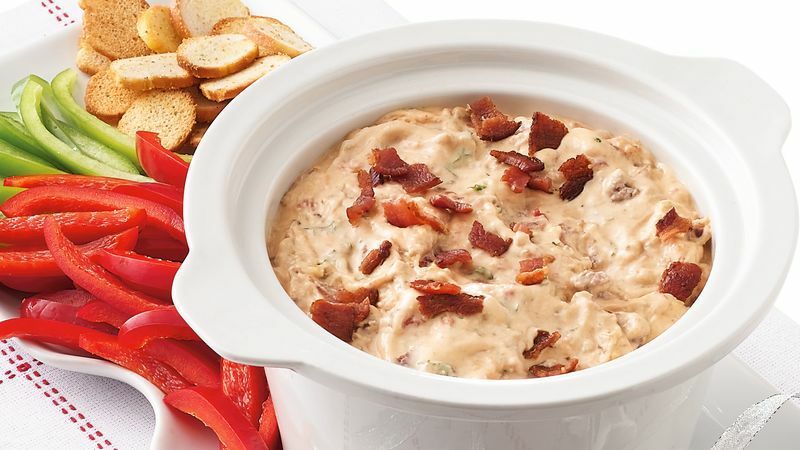 Stir in cream cheese, shredded cheese, tomatoes and crumbled bacon until well mixed and cheese starts to melt. Pour mixture into 1- to 1 1/2-quart slow cooker. Cover; cook on Low heat setting 2 to 3 hours or until hot and bubbly. Stir parsley into dip. Sprinkle with reserved bacon for garnish. Keep on Low heat setting to serve. Serve with bell pepper strips and bagel chips. To cook bacon quickly, zap it in the microwave until crisp. Choose plain or any savory flavor of bagel chips for dipping.